Connect your USB-equipped desktop or notebook to a wireless network at incredible speeds with the Linksys WUSB54G USB Wireless Adapter. By incorporating two new, blazing fast technologies -- USB 2.0 and Wireless-G (802.11g) -- the Adapter delivers data rates up to 54Mbps (5 times as fast as 802.11b), without the trouble of opening up the case of your desktop computer. To install, simply plug the Adapter into any available USB port. (It's compatible with both USB 1.1 and 2.0 ports, but 2.0 will yield the fastest speeds.) It gets its power through the USB connection, so no power cord is necessary. The included Setup Wizard walks you through configuring the Adapter to your wireless network settings, step by step. The Wireless-G USB Network Adapter is also compatible with the Wireless-B (802.11b) network standard, with data rates up to 11Mbps. And your wireless communications can be protected by industrial-strength Wi-Fi Protected Access (WPA) encryption, so your data stays safe. Take a look here if you want to buy this Linksys WUSB54G USB wireless adapter! I have a SOHO that uses a wired 10/100 switched network. Already part of this network is a Linksys single port Cable / DSL Router. When it came time to make the jump to wireless, the WAP54G seemed the logical choice, as I would not have to reconfigure anything on my existing network. For my initial conversions, I was converting a desktop PC and an older laptop. For this review, I'll be discussing at the WUSB54G. Look for reviews on all these items posted separately. I decided on the WUSB54G because I did not have any available internal slots. This computer may be replaced in a year or two, and unplugging the network card from a USB port seemed a lot more attractive than opening the case. Actually, the installation is almost a simple as plugging the adapter into an available USB port. My initial installation was using Version 2.0 of the installation software. The significance of that will be explained later. Regardless of your version of Windows, I suggest installing the software first. This will eliminate any potential problems in the installation process. Make sure you know your network name and WEP Key. You will need to supply that information during installation or you will not be able to connect right away. If you don't have the key handy, it can be input later, but it is not as convenient. The Wizard does a good job of walking you through each step. Once done, you will need to reboot. Don't disconnect from the wired network just yet. Wait until the next phase is completed. On boot, you computer should detect the new hardware and install the correct drivers for it. The next step could take a while, so be patient. Your new wireless network card will search for a signal, an access point, and you should be prompted when a network is found. If more than one network is detected, a distinct possibility with the proliferation of wireless networks, you will quickly realize the advantages of naming you network something other that the default and of applying a WEP Key to your network. The initial connection took about two minutes, but seemed a lot longer! You will see an icon on the Bottom Right of the Task Bar indicating you are connected. I do one final check by opening a command prompt and using the command "ipconfig /all" to show all my adapters. If there's a difference in IP addressing ranges, reboot one more time. If both the wired and wireless connections show IP address in the same range, you're ready to unplug the wired connection. Now try opening your web browser. If you can surf, you're all done. My experience with this installation was very positive. The wizard was friendly, the physical installation could not have been easier, I had all the information on hand I needed and I was wireless after the first reboot. I'm using this adapter with a G network and I'm getting the full throughput. One final note: this installation went so smoothly I got another adapter from a local dealer that had a price too good to pass up. When I got home, however, I noticed a small sticker that said this was for Windows 2000 and Windows XP only. I then noticed the serial number and installation software said version 1.0. Hmmm... this was going on a Windows 98SE machine. The hardware specs looked identical, from what I could determine from the box, so I tried an experiment and used the version 2.0 software. It worked just fine. BEWARE: this is not an endorsement that this will work in every case nor should you conclude there is no difference between versions. I strongly suggest you try to get the latest version hardware and software for optimal performance. I am using this on a home network with a Netgear Wireless-G access point. On the same wireless network, I have a Netgear PC card (WG511) and a D-Link PCI Adapter (DWL-G520). Installation and set up couldn't be easier (I installed on Windows XP), but the speed is very disappointing. It shows the connection speed with the access point as 54Mbps, but when I do a speed test with my ISP, I get less than 300Kbps (downstream) whereas my other clients constantly give 1.2Mbps. I believe it is the limitation of USB. On normal browsing, I don't notice any difference, but big downloads are very time consuming. I had bought this to save PCI slots, but I think I made a wrong move. My piece of advice - buy this only if you don't have a vacant PCI slot and if you don't do any big downloads. If you have a vacant PCI slot, go for the PCI version because that is definitely more compact and efficient. If you don't have a PCI slot, I would recommend you make one by getting rid of adapters that you don't use (like a modem). I haven't seen a review yet that really compared options among various wireless adapters so I thought I'd give it a try. I live in an apartment complex with concrete walls that barely allow for a cell phone signal. The little bit I use the internet I didn't want to pay 60$/month so I bought a Linksys WUSB54G Wireless-G USB Adapter, Netgear WG511 Wireless 802.11g PC Card, and a Hawking WIRELESS G USB NETWORK ADAPTER w. Hi Gain 6db Antenna basically just to make sure I got one that would work. The worst of the 3 was the Linksys usb adapter. It could pick up weaker signals without having to balance the laptop at a weird angle out the window, but the software which runs it doesn't like weak signals so anything under 50% keeps the thing scanning even after you're connected. which means constant disconnects unless you manually stop the scanner while connected. Even then, it had a frustrating habit of losing the connection. The Netgear card was much better at holding a signal, although it did require a balancing act and careful angling to get the signal. The software was great. The biggest complaint I had with this is I was dealing with really low signals which slow the internet to a crawl. It would take a few minutes to load yahoo. With better signals the card would be great. The Hawking usb adapter is by far the best of the bunch. I'm picking up signals I never saw with the other two, and they are coming in with decent percentages. The software couldn't be better. Connection doesn't take minutes like the other two, and the radar dish antenna can be pointed for better signal gain. I haven't had a connection loss once using it, and the internet is running at better than dial up speed (I'm connecting to a 23% signal). Overall, I'd pick the Netgear card for travel with a laptop due to it's size and portability, but for home use the Hawking usb adapter was head and shoulders above the others. I didn't want to install a PCI card. I read reviews for almost all of the USB adapters. I saw the problems many said they were having with this one. Even so I went ahead and ordered it and I am glad that I did. It took me a little longer to figure it out than I wanted it to. I also downloaded the most recent firmware which was recommended in one of the amazon.com reviews. This thing works flawlessly! It also shows well. I am using the encryption, so when I shut down the connection it has to be restablished. I found that by clicking on the XP wireless icon and then going to "repair" it sets it right back on track in 20 seconds or so. I think if I had purchased another brand, as recommended by C|Net, etc, I would have been sorry. This stuff (I got a WRT54GS Router at the same time) is really something. I knew nothing about setting up a wireless connection. True the manual that comes with the router, etc. is in need of some major help, but it is worth the hassel (if any). Once you get it going it is smooth, fast, reliable, and dependable and it doesn't get better than that! I bought this to tackle a wireless trouble spot in our house. Originally I installed a D-Link PCI card in the computer but would often lose connection. I installed a better antenna, still no luck. I sold that NIC and tried the Powerline method, connecting my network to the home wiring. That worked well initially, but every day or two the connection would die and the only way to bring it back up was to wait...sometimes for hours. All these problems happened to my wife's computer, so by this time she's a bit frustrated and I'm getting annoyed at her constant complaints. We have the 802.11b version of this adapter hooked to a TiVo box and it's worked great, so I thought I'd try the 'g' version for my bride's machine. I definitely wasn't going with D-Link - I had a lot of trouble with D-Link adapters on multiple machines and I didn't want to go through that again. In addition to this adapter I also ordered the 16' USB cable from Belkin, a bargain at around $10. I figured the length of the cable would allow me to find some place to position the adapter to get a signal. I'm happy to report I made the right decision. I installed the software first, as instructed, then connected and configured the adapter. 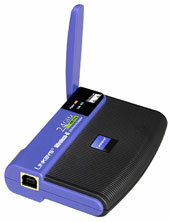 This was all easy to do - the Linksys software is user-friendly. We use encryption on our network so once I plugged in the key and found a spot for the adapter (the 16' cable was a smart buy) my wife hasn't had a single problem. Actually, she had one problem. She was starting her mail client too quickly after booting and before the computer had connected to the network and received an IP address. She now waits about 15 seconds after Windows loads to check her mail or open a browser and she hasn't had a single complaint since! I definitely recommend this product, and the 'b' version if you have a TiVo. I'm sticking with Linksys from here on out (I also have their NSUL2 Storage Link which is great for adding storage to your network to be shared by all users).